Britain's Tyson Fury will have the suspension of his boxing licence reviewed by the British Boxing Board of Control (BBBofC) in January. The 29-year-old was given a two-year doping ban by UK Anti-Doping (Ukad) for testing positive for a banned steroid in 2015. The ban was backdated, meaning the former world heavyweight champion was free to box again. The BBBofC revoked his licence in October 2016 because of medical issues. Tyson Fury's cousin, Hughie Fury, has also been cleared to fight again after he also tested positive in February 2015. Tyson Fury blamed the result on eating uncastrated wild boar. In a statement he said he and Hughie Fury were "happy" the issue had been settled and that they can "move forward knowing they will not be labelled drug cheats". The fighters' bouts in February 2015, including Tyson Fury's victory over Christian Hammer, have been disqualified but results after that date, along with the win over Wladimir Klitschko, stand. In a video posted on social media on Wednesday, which has since been deleted, Tyson Fury suggested he may opt for a licence with an alternative governing body to the BBBofC. "Who knows, I might not even go back to the British Boxing Board of Control after how they have conducted themselves and the manner in which they behaved around the whole thing," he said. "So get it out of your mind that it's cement I am going with you guys. Because I have a vast array of board of controls around the world with open arms welcoming the Gypsy King." Fury secured the WBA, IBF and WBO heavyweight belts by defeating Klitschko in Dusseldorf in November 2015, although he was forced to relinquish the IBF title soon afterwards, having refused to fight the organisation's mandatory challenger. He was then forced to postpone a rematch with Klitschko scheduled for summer 2016 because of injury, before he withdrew altogether. The Fury cousins were charged by Ukad but had their provisional suspensions lifted in August of that year after appeals. Two months later, Tyson Fury gave up his world titles to focus on his mental health and the BBBofC suspended his licence "pending further investigation into anti-doping and medical issues". WBC heavyweight champion Deontay Wilder says he would welcome Tyson Fury back to the ring and would want to fight him - once the Briton is fit enough. "He's got a lot of work to do still, this is the first step of coming back now," Wilder told Newsweek. "The second part is really to get in shape, get healthy so he can come back and compete at the top level. 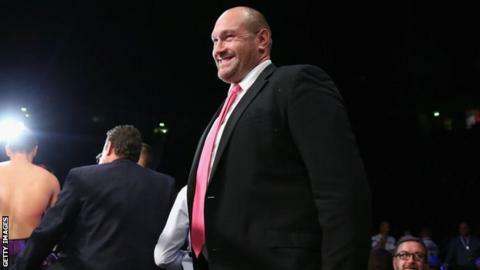 There's still a long way to go for Tyson Fury but I'm glad he's back." The pair had been tipped to meet each other before Tyson Fury's suspension but Wilder says the bout could be a while off yet. "I would love a Tyson Fury fight but for right now there is no need to waste my time and send a message to him until he comes back and proves himself."